At the Paris Mondial de l'Automobile SsangYong is showing the first fruits of its relationship with Shanghai Automotive Industries Group – a new compact SUV, codenamed C200 which has been designed by Giorgetto Giugiaro. It signals the start of a major product offensive – 20 new models on five new platforms, over five years, starting in 2009. “The car is very, very important for us as it’s the first demonstration of the new strategy that was announced at Geneva,” says SsangYong UK managing director Paul Williams. Its significance runs deeper, he says, as it is the first monocoque-bodied car ever produced by the Korean company, and the first with front-wheel drive. 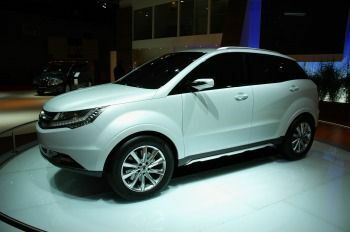 And that means the SsangYong range will in the future include passenger cars as well as SUVs. The C200 has been styled by Giugaro, whose ItalDesign styling house is working closely with SsangYong on new models. The C200 gives a good impression of the look of future SsangYongs, Williams adds. There will also be an all-wheel drive version of C200, and for the time being Williams is keen to stress the SsangYong “brand DNA” will remain focused for the moment on SUVs. There is likely to be some degree of Rover content in some of the new cars. SsangYong parent SAIC is now producing cars based on Rover platforms, as well as updated versions of the K-series Rover petrol engines, and these engines in particular are likely to be used in SsangYong’s future product. The Rover X60 platform is also likely to form the basis of some of the more conventional cars – effectively Giugiaro-styled Rovers.